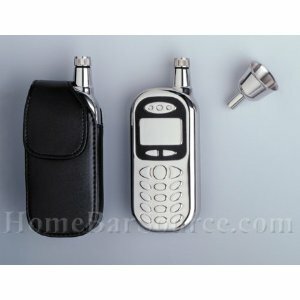 This undercover cellular phone style flask can be discretely transported. Its durable stainless steel construction makes it ideal for both indoor and outdoor use. Four ounce capacity, screw-down cap. Includes leather case, funnel, and foam-lined gift box with insets for flask and funnel. 5''x2''x0.87'' flask dimensions. Great novelty gift for anyone that is interested in making their soda taste better. It's a great buy take advantage of this offer while it lasts.